Home>Blog>Water Care Tips>It’s Time to Oxidize! 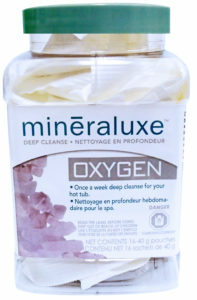 An oxidizer is a great way to ‘shock’ your tub or pool and enhance the waters dazzle. Oxidizers will destroy chloramines and reduce waste by literally burning it off. The only thing left after is oxygen. Careful though, an oxidizer should not be your sole form of keeping your water clean and should be used in partnership with a proper sanitizer such as Chlorine or Bromine. Come in and talk to your Beachcomber Hot Tubs, Pool & Patio Water Care Specialist about the best ways to cut down on use of harsh chemicals and still maintain a clean, safe and soothing water experience. For other tips and answers to frequently asked Water Care questions, check out this great FAQ page.